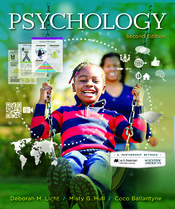 The new edition of Scientific American: Psychology places an increased emphasis on active learning in the book, online, and in the instructor resources. The new feature “In Class: Collaborate and Report” provides instructors and students with engaging, active learning opportunities directly in the flow of the book. There are additional “Collaborate and Report” activities included in the instructor resources as well. Preview a sample "In Class: Collaborate and Report" activity from Chapter 11, Personality, below. You can also visit our Psychology Community to tell us how you'd use these new activities in your classroom!